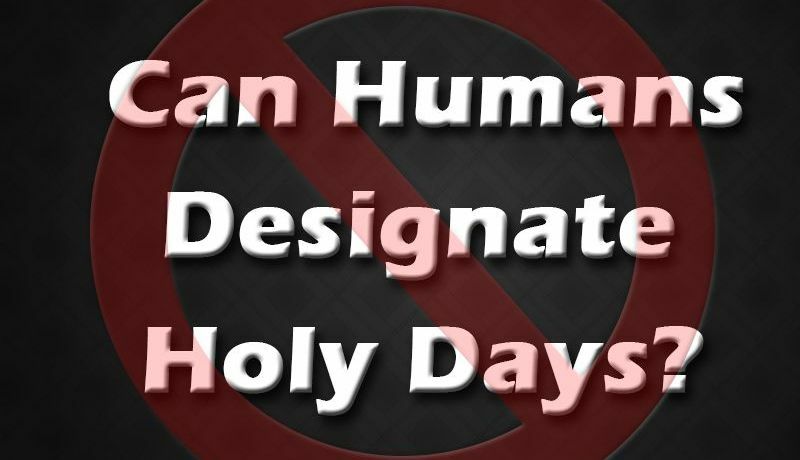 Can humans designate which days will be holy? Or is creating holy days something only the holy Creator God can do? Christians have always had the freedom to decide whether to obey God or not and when to pray, study the Bible, fast and practice spiritual meditation. In reference to choices about vegetarianism and fasting, Paul wrote: “One person esteems one day above another; another esteems every day alike. Let each be fully convinced in his own mind. He who observes the day, observes it to the Lord; and he who does not observe the day, to the Lord he does not observe it. He who eats, eats to the Lord, for he gives God thanks; and he who does not eat, to the Lord he does not eat, and gives God thanks” (Romans 14:5-6). But these prerogatives of free moral agency in our relationship with God do not extend to determining which days are God’s holy days. While we may choose when we will exercise personal spiritual activities, God is the one who determines holy time that supersedes human choice. In teaching the ancient Israelites about His feasts, He instructed Moses, “Speak to the children of Israel, and say to them: ‘The feasts of the LORD, which you shall proclaim to be holy convocations, these are My feasts’” (Leviticus 23:2, also see verse 4). The first of these divinely appointed days deriving their authority and existence from God Himself is the weekly Sabbath. As God stated, “‘Six days shall work be done, but the seventh day is a Sabbath of solemn rest, a holy convocation. You shall do no work on it; it is the Sabbath of the LORD in all your dwellings’” (verse 3). Some have mistakenly thought that because there is no physically discernible difference between a holy day designated by God and any other day, humans can decide when to hold special celebrations to worship Him. The weekly Sabbath and holy days are similar in that we are not to do our customary work on these days (Leviticus 23:3, 7, 8, 21, 25, 28, 35, 36). They are to be observed from “evening to evening” (verse 32), meaning “from sunset … to sunset” as the Good News Translation renders the passage. Some have mistakenly thought that because there is no physically discernible difference between a holy day designated by God and any other day, humans can decide when to hold special celebrations to worship Him. Representing this line of reasoning, some say that Christians today can simply choose one day in seven to worship God. This mistaken way of thinking overlooks the fact that God gave very specific dates for each of His days of worship. He didn’t say, choose one day out of seven or choose seven different times in the year for My annual holy days according to what best fits your schedule or just make up your own days of worship. If God intended to give humans the right to alter the dates of His feasts or make up their own days, He certainly could have seen that this was written in the Bible. But He didn’t do this. Instead, He was very clear about the specific days that were His holy days and about His expectation that these days be observed. For example, God told the ancient Israelites that the Sabbath was to be observed even during the times of plowing and harvest—critical times for farmers (Exodus 34:21). Furthermore, those who broke the Sabbath were to be put to death (Exodus 35:2). While this punishment is not enforced today, it does illustrate the importance God placed and continues to place on this day. As for the Day of Atonement (one of God’s holy days), God said, “For any person who is not afflicted in soul on that same day shall be cut off from his people. And any person who does any work on that same day, that person I will destroy from among his people” (Leviticus 23:29-30). In spite of God’s clear instructions as to which days should be kept holy, the ancient Israelites tried establishing their own days of worship with tragic results. Throughout their history, the ancient Israelites dishonored God by abandoning His prescribed days, by establishing their own days of worship similar to God’s, by practicing syncretism—that is, trying to combine the worship of God with the pagan practices of other nations—and by outright idol worship (Jeremiah 17:21-23, 27; Exodus 32:1-5; 1 Kings 12:32-33; Zephaniah 1:4-6). Because of these sins, God allowed both Israel and Judah to go into captivity. When it comes to holy time, we also note something very important about the Sabbath command. God said, “Remember the Sabbath day, to keep it holy” (Exodus 20:8). The clear instruction from God is that we are to respect this specific day by keeping it—not merely a day of our choosing—holy. God is the One who designates His holy days. Read more about God’s holy days in this section on how God’s holy days reveal His plan of salvation.